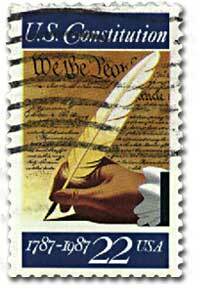 1987 marked the 200th anniversary of the U.S. Constitution. 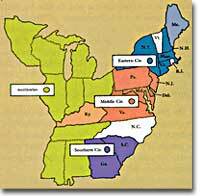 This maps shows how the U.S. in 1789 was divided into 4 federal court districts. Take note that Rhode Island and North Carolina had not ratified the Constitution and weren't part of the districting. Rhode Island didn't send any delegates to the Constitutional Convention. In fact, the only thing that prompted Rhode Island into ratifying the Constitution was the other states planning to divide the state up between them. Read an in-depth history of the smallest (and one of the feistiest) states in the Union. Almost all the states that had with narrow margins of victory for the ratification of the Constitution called for a "Bill of Rights." Provided by the Library of Congress, the site has the entirety of the first 10 amendments to the Constitution, ratified in 1791. George Mason is seen as the father of the Bill of Rights. This site is a in-depth and well-designed resource on the life and times of George Mason, from a chronology of his life to the listing of his plantations and landholdings. Be sure to look at all the pictures from Mason's former home, Gunston Hall. Those Glorious "Principles of 1776"
Did the struggle between Anti-federalism and Federalism that forged the Constitution and the Bill of Rights lead to the Civil War? Read this essay written in 1976 as part of the Bicentennial Celebration and decide for yourself if the issues of 1787 still breathed fire in 1860. The Library of Congress presents a succinct review of the writing and ratification of the Constitution and its amendments. This site will help wrap up all the information on the creation of the American government's most important document.